I have written two books! 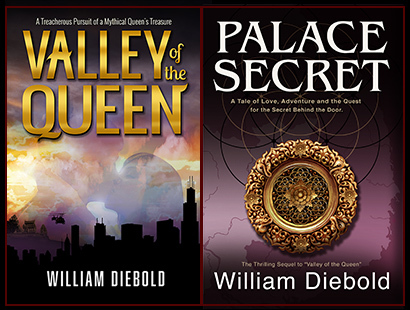 They are "Valley of the Queen" and "Palace Secret" and can be found on Amazon.com. The first 100 pages of Valley of the Queen are based on my personal experiences as a photographer in Vietnam and later as an advertising photographer in Chicago. But then the narrative takes off on a very exciting and unusual tale of adventure and romance. I started writing because it was something I always wanted to do, and then I discovered I really loved doing it. At first, I was not sure it wasn't just my folly. But as more and more people read my books and really liked them, I was encouraged. Palace Secret takes up where Valley of the Queen left off. Here is a part of what it says on the back cover: "For thousands of years the earth has held a secret that promised prosperity and power to whom it is revealed. Civilizations have come and gone and mankind has contrived ever more intelligent ways to prey on each other. Yet the secret remained until recently. A professor of archeological studies discovered a link to that secret and it led him to Siem Kulea where Jack and Mai have settled. The bond of love between Jack and Mai is never tested but the peace of their valley is as evil adversaries seek the means to open the magnificent and mysterious door hidden below the White Palace. It becomes a surprising and thrilling contest that takes them around the world to see who finds the answer first in this all-or-nothing contest." Many have said they like the second book even more than the first and I am now working on a third. "There are hundreds of careers in Art for a student to choose from. If you are passionate about your work you will be successful and make a very good living from it." No one told me that in high school. I was left with left-brain choices that my parents recommended such as Accounting and Engineering. Unfortunately, those were the days when, if you did not know what you wanted to be, you were likely to get drafted and sent off to war. I was one of those. I spent two years and three months in Vietnam as a photographer. That changed me dramatically because it was then, for the first time, that I knew what I wanted to be. That simple decision of a chosen profession was life changing for me. I graduated from Art Center College of Design in 1974 and for 25 years I was an advertising photographer with studios in Chicago and Dallas. I had a successful career as an Advertising photographer and when the digital imaging age came with the onset of the Adobe Photoshop program I was there at the beginning to embrace it. At the time, many of us were learning the limitless possibilities of the digital world and working to master the new and complicated programs on computers that had very limited, and very expensive RAM memory. I lost one very large job (retouching 35 American Airlines transparences) when a creative director told me she did not believe I could do her job on a Mac, because her husband owned a Mac and he couldn't do it. We had gone through a technology door that changed the industry exponentially. It was a learning curve for everyone and we all had to adapt or be left behind. Now those ideas and those days seem primitive as will the next generation of technology looking back on the present. At one point I decided to teach. I wanted specifically to teach high school and not college. I wanted to bring the message of the possibility of a career in an art-related field to students who were just making up their minds about career goals. There are plenty of frustrated right-brained students who do not like Math or Science and feel life has very limited possibilities for them. I remember students coming into my classroom thinking they cannot be designers or art directors because they can’t draw. Many of those students by the end of the year had chosen careers in Art.